Tests for statistical significance, autocorrelation and multicollinearity. Compatible with all versions of Excel for Windows as well as Excel for Mac as a cross platform data analysis and forecasting solution. More resources for the Multiple Regression Analysis and Forecasting template including video, user manual and support can be found on the Excel Multiple Regression Analysis and Forecasting Template page. I sought out this particular spreadsheet to help me with the process of estimating software production costs in my various projects. I am very glad that I chose to use this particular spreadsheet because of the price and because it has utility in other mathematical computations that I desire to perform, such as analyzing stocks and options. I recommend it to anyone who wants to perform multiple regression in a well managed way. 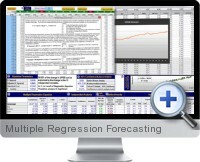 This product is extremely helpful for easily creating a regression model. Prompts allow for simple explanations of the different elements that make this easy to use even for those less familiar with statistics. This product was able to help me develop a model to predict net sales for our business that wowed the brand manager. Overall, a great product. I used the regression forecasting for my medical research (clinical studies in ophthalmology). Absolutely user-friendly and fast tool that allowed me to quickly understand the key parameters influencing the outcome of a certain surgical procedure. Thank you! The regression template is easy to use and sufficient for what I need. I'm using it to test the value drivers that we have identified to build up our price for a certain product group. Nice. I've been using the Multiple Regression Forecasting from Business Spreadsheets for that extra advantage in Daily Fantasy sports. I love how it can pinpoint the relational aspects between different statistics. The potential here is immense.